Son of Steak might be the child of Harvester, but it is Harvesters confident, mid-twenties, hipster child. Large filament lightbulbs must have been shipped in by the dozen along with the classic distressed wood and exposed metals. Blink and you might be in Pieminister, MOD, Inferno or Reds. You certainly won’t think you’re in a Harvester so I suppose that is the idea. They must have the wrong playlist to accompany their new look as Wham! greeted us, an unusual juxtaposition. Upon surveying the menu the same could be said. 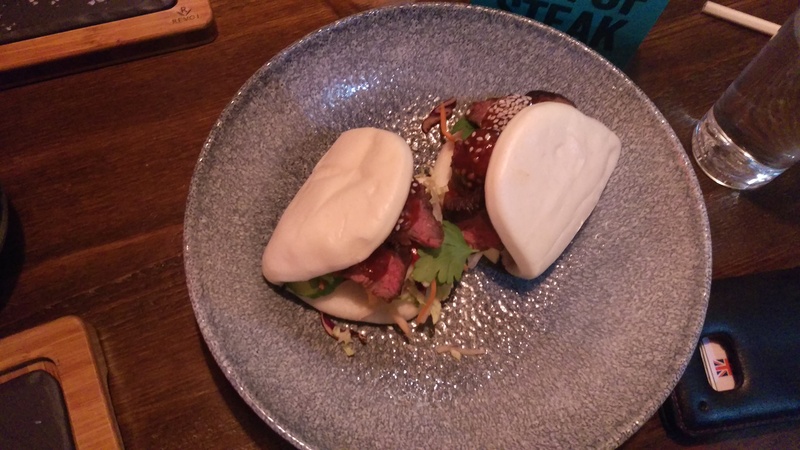 Very much on trend in the country at the moment are Bao and the Taiwanese buns weren’t what I expected to see on a steakhouse menu. The rest of it was exactly what you look for – yes there were the traditional cuts but also some of my favourites amongst the less well known ones in the UK. They also do burgers and chicken, ubiquitous of course. One cut of beef I often look for is Picanha (£7.95 8oz) which is particularly popular in South America. It is from the top of the rump and is not as tender as a lot of cuts but has more flavour than most. Here sides aren’t included in the price but you can get two for a reasonable £3, we shared onion loaf and a salad as well as large chips at £3.75. The steak was requested medium rare, I would usually go for rare but with this cut being less tender slightly more medium is often better. Unfortunately for me it was slightly overcooked and medium at best. Whilst this overcooking was a cardinal sin I still really enjoyed it. The flavour was good and it was generously seasoned with sea salt, I also recommend truffle mustard (£1) that I dipped almost anything in. Chips were great, some of the best around with the ideal crispy / fluffy ratio for me. An onion loaf was also a strong side, an interesting alternative to the classic ring. Sort of like an English onion bhaaji that was satisfyingly crisp. I almost wished I had stopped there. My curiosity had gotten the better of me and I’d ordered the aforementioned bao. The steak version is £8.60 and seemed a little steep to me as I’m not sure I’d be satisfied if this was my main course. The sauce was well flavoured but for the price you don’t get too much meat for your money. My dining companion (people always say that in blogs, it was a mate called Jack) had recommended it after having a Son of Steak Deliveroo. He also made a favourable comparison to another new steakhouse, Miller and Carter where he had recently been. Overall Son of Steak is great value, just as I suppose Harvester represents at a different end of the market. I could have had a steak and chips for £10 and there could be few complaints with that. I previously have enjoyed a Picanha at The Larder on Goosegate and although their offering is 1oz more it is around £10 more expensive. I am going to say I was unlucky with the cooking of my steak as others, including Jack’s, were delivered as requested. Had mine of been spot on it could have scored a rare 8… but the cooking of my meat and the average bao knocks it down a little. That said the visit. still exceeded my expectations and I think I might be back to try a Lomito or their signature flatiron at just £7.20 for an oz. I really enjoyed this place too. 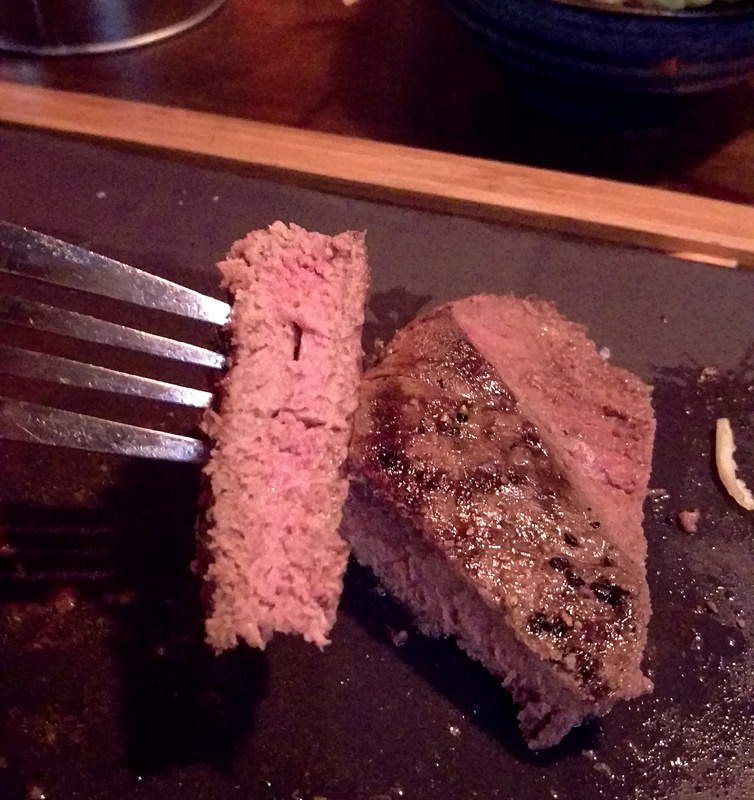 I have to admit, I dislike steak usually. However the picanha, cooked medium rare was amazing! I’ve been twice in a week, unusual for me! Didn’t enjoy the Bao bun either, but I guess they can be excused as it’s not their speciality. If you know anywhere in Notts that I can get a decent Bao, please let me know! !